Aluminum coated with magnesium fluoride over coat. Mounted in adjustable mirror cell. Secondary mirror aluminum coated with magnesium fluoride over coat. Included with purchase of telescope. G.W. 45 lbs. N.W. 39.7 lbs. 30.3" x 17.9" x 17.4"
25.4" x 24.8" x 5.3"It's not just a big telescope. It's a big telescope that goes anywhere. New LightBridge truss-dobs from Meade take down and set up quickly. So you can take one of these massive windows on the universe out to your favorite dark sky locations with ease. 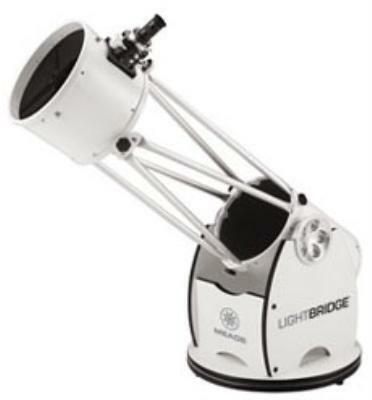 LightBridge dobs give you high quality Meade optics, premium components, and ultra portability - all for about the same price as an ordinary tube dob. So get a LightBridge truss-dob. And prepare to cross the universe. Diffraction Limited Optics - Meade optics consistently outperform telescopes of similar and larger aperture. Consumers know that "Meade Optics Inside" means that what they see through our telescopes will be views that are detailed, crisp and full of contrast. Meade Optical Coatings - Aluminum Coatings with magnesium fluoride over coat provides bright images full of detail. 2" Crayford-Style Machined Aluminum Focuser With 1.25" Adapter - Smooth precise focusing is achieved with this classic design. A unique focus tension knob and focus lock design gives complete control over focus. Steel RA Roller Bearings - Roller bearings make movements smooth and effortless. Built-In Primary Mirror Cooling Fan - Bring the telescope into thermal equilibrium quickly and efficiently with the battery powered cooling fan. The fan is mounted to the rear of the "vented" primary mirror cell for fast cool down. Advanced Four-Reticle Red Dot Viewfinder - Four reticles and varying brightness controls allow this deluxe finder to adjust to your observing needs. Click the button below to add the Meade 10" LightBridge Truss-Tube Dobsonian to your wish list.